Buying pearls online can be difficult, especially if you are not familiar with pearl sizes. For those who aren’t sure what pearl diameter they prefer, we have provided these images for comparison purposes. Freshwater pearls range in size from as small as 5mm to as large as 13mm. Pearls below 7mm in size are considered to be on the smaller side, while 7-8mm and 8-9mm are among the more popular sizes selected for necklaces in Freshwater pearls. Anything sized from 9-10mm and above is considered to be above average in size, and such pearls are more rare and valuable. 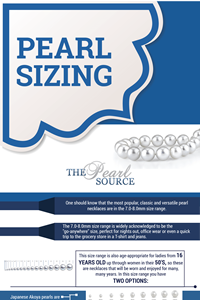 Please download and print our pearl sizing guide below for more information. Please include attribution to https://www.thepearlsource.com with this graphic.